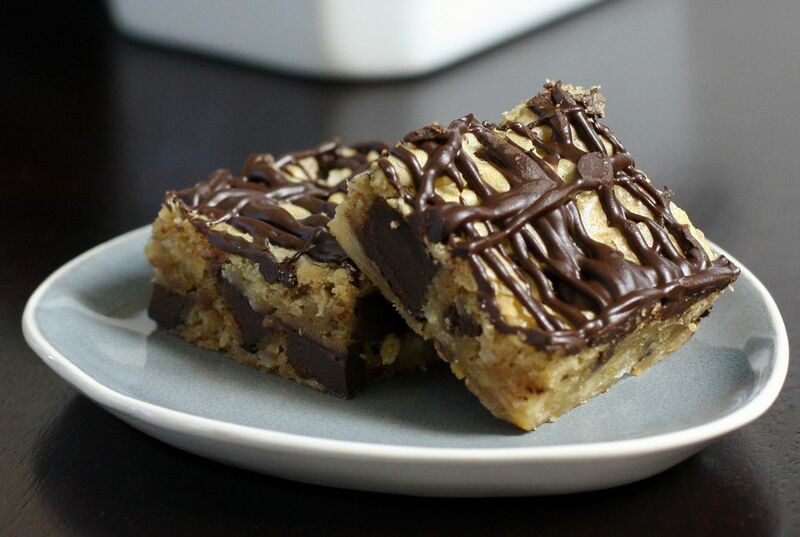 Coconut and chocolate chunks or chips team up in these delicious chewy blondies. Take these bars to a party or potluck and get lots of smiles. Grease and flour an 8- or 9- inch square baking pan. Combine the flour and salt; set aside. Beat in egg and vanilla extract until well blended. Slowly beat in the flour and salt until blended, then stir in the coconut and chocolate chips or chocolate chunks. Bake for 20 to 25 minutes, or until set in the center but still soft. Do not overbake. Let the bars cool slightly before drizzling with chocolate, then cool completely before cutting into small squares. For topping, if using, melt chocolate chips with 1 teaspoon of butter or shortening until smooth. Drizzle over the bars with a spoon or pour the mixture into a sandwich bag and cut a very small piece of the corner off. Drizzle, squeezing the chocolate out over the bars.